Polycarbonate (plastic) lens with perforation frame provides high level of impact resistance, but is not unbreakable. For use against low to moderate impact hazards such as metal, chips, small flying particles, and limited protection from dust, sparks, and splash. 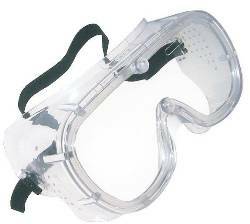 Not to be used for protection from laser, molten metal, welding, cutting, or burning, or any other operations which may expose your eyes to harmful levels of infrared radiation.